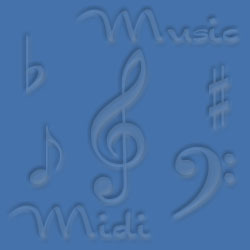 On these pages you will find many of the Midi files I have collected on the Internet. As to the copyright concerns I can only say it is not my intention to infringe on anyones rights. These files are placed here not for profit but solely for the listening pleasure of the people that honor my site by visiting. Special thanks to the various artists who no doubt worked very hard to create and refine these midi files. It's no light accomplishment I'm sure. If you don't have it Then get it here! MUSIC | SAILING | JAVA PLAY | RUBIC'S | MY FRIEND TEACHER OF THE YEAR | WHAT'S NEW?